It seems after a short disappearance, Avonlea Clothbound Cheddar is back. I absolutely love this cheese. 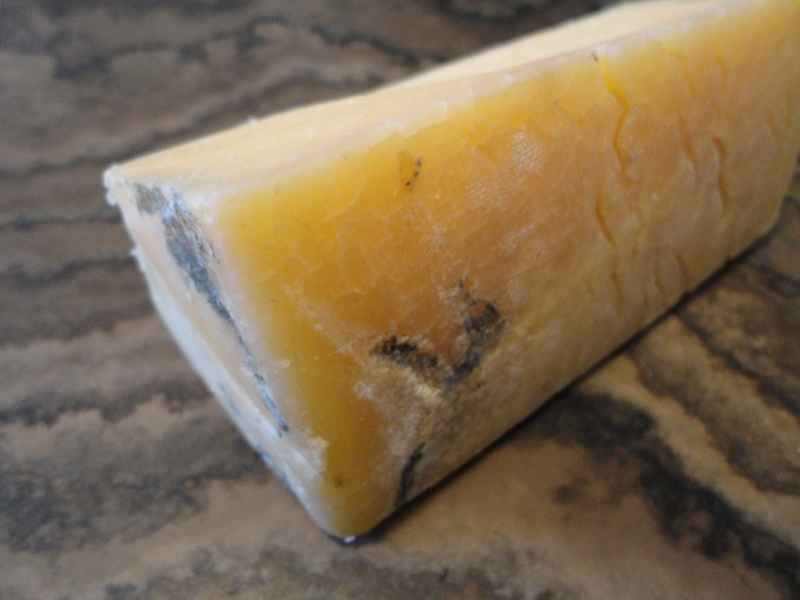 True to the traditional techniques of making cheddar, this truckle is wrapped in cloth to age for a minimum of one year, creating a classical blue mold marking on the rind. The colour is golden yellow and the texture is fudge like. I get butterscotch, caramel, and mineral earthiness on the palate. The sweet is dominant but there is just the right amount of salt to wet my mouth. Avonlea Cheddar is made on P.E.I Island in the east coast of Canada.The head cheesemaker at Cows Creamery, Armand Bernard, makes Avonlea with milk from Holstein cows and uses a traditional cheddar recipe from the Orkney Islands, off the north coast of Scotland, which he learned when he worked in the U.K. This cheese recently won best “Aged Cheddar 1-3 years” at the Canadian Cheese Grand Prix.